Birmingham's Largest Wheel & Tire Inventory! More than just wheels, we're your complete wheels & tire source! We are your largest showroom for custom wheels in Birmingham, Alabama! Drop by and check out our huge showroom of wheels, today! We'd love to help you find your perfect set of wheels! We have Custom Wheels and Tires for your Car, Truck or SUV with affordable prices; and we offer 50% discount on rotating and balancing for the life of your tires, purchased from PoBoys. To get you fitted and styling with your new set of wheels and tires, we offer flexible payment options including: cash, credit/debit card, financing, and rent-to-own. 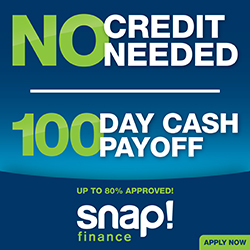 ​Our easy qualifying financing programs offer a no-credit needed option, with 100 days same as cash. And, if better for you, we even offer an in-house NO CREDIT CHECK RENT-TO-OWN program! Our wheel experts will assist you, to ensure you are selecting the right wheels for your ride! ​ ​We stock wheels in top brand names like: Azara, Borghini, Dcenti, Dub, Gima, Lexani, Velocity, Vision, Rosso, Versante and more! In addition to our large selection of wheels, we carry many tire brands like: Bridgestone, Dcenti, Duraturn, Fullrun, Goldway, Goodyear, Hercules, Lexani, ToyoTires, and Venezia. Easy Financing: Snap! Finance or rent-to-own!